Last week I didn’t have the whole spoiler, so today, before you prerelease, I want to remind you to trade everything away. People will pay/trade more for these cards right now than they will at any other point. Now, on to the rest of the cards I want to talk about. Mostly I’m basing my price predictions on their casual appeal, and if something gets popular in Constructed, expect a strong surge. 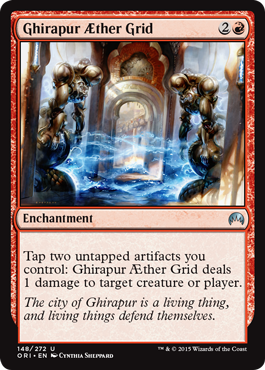 There are two equally annoying modes on this card and unfortunately, Tax decks are a thing, usually led by the Grand Arbiter Augustin IV in Commander. This might have a place in a white devotion strategy, or some other deck. It combines can’t-attack and can’t-block effects, but instead of paying two or more mana, it’s just one. I doubt this will ever be worth much more than a $4. Value comes in many shapes and sizes. This gets you a range of things, but I imagine that in Commander especially, this will fetch up Eternal Witness pretty often. I wouldn’t overlook what Riftsweeper can do if people like to exile your pretty toys. Also note that you can find anything that’s even partially green. Savage Knuckleblade, Knight of the Reliquary, Shambling Shell…whatever you need. I think this has potential to keep a decent amount of value. I’m expecting it to stay in the $5-$10 range. This is the combo piece that a lot of casual decks have been craving, even if they didn’t know it. This will be a card with a higher-than-expected foil price for solely that reason. A surprising number of decks in a lot of formats don’t know what to do once they make 5,000 Myr tokens. The Grid allows for the game to instantly end, which is often a blessing in disguise. Even foils of this uncommon won’t be worth much more than two dollars, unless there’s yet another infinite combo deck in Modern that exploits it. Key here is the targeting clause. It’s not just spells. It’s abilities as well. I am drooling to get one of these into my Experiment Kraj EDH deck and if someone at my prerelease opens a foil of this I’m going to overpay badly. This is probably a bulk rare and a five-dollar foil. Too much has to go right for this to be good, but that’s never stopped us. 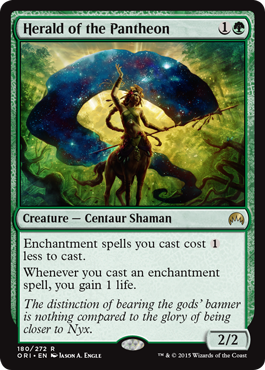 As an enabler, this fits right into any Enchantress deck in any format. Amusingly, those decks tend to get stuck on mana, not cards, and the life gain is a handy bonus too. Still, it’s a minor cog and won’t ever have a huge price. It’s sort of a shame that Wizards is stopping core sets right when they decided to use those sets to supercharge the soon-to-be-rotating block. 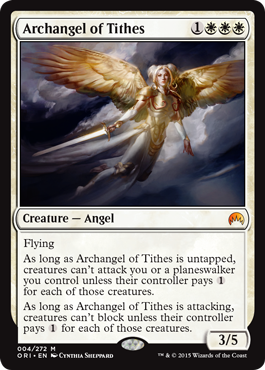 It might just be coincidence, as Theros is featured in KG’s backstory. The Titan has a lot of potential and requires multiple readings to get right. 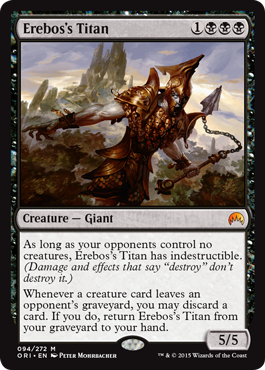 What isn’t clear is if cubes want this or Phyrexian Obliterator for their mono-black aggro decks. 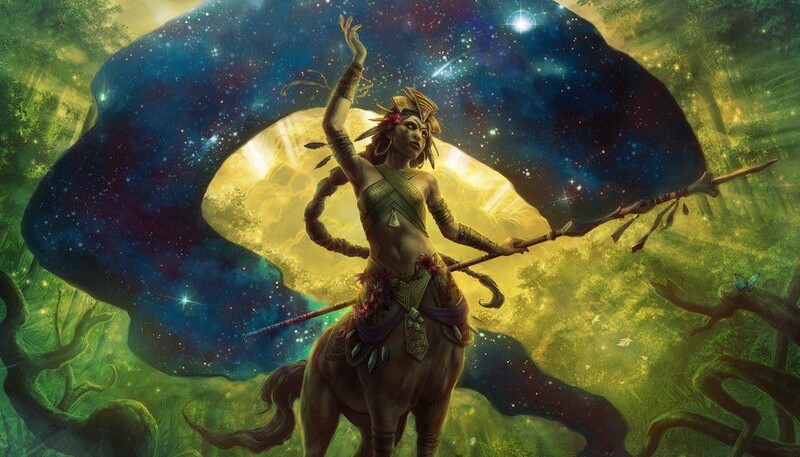 There’s a long and awesome history of four-drop 5/5 creatures in black, and this one has two upsides! Not to be overlooked is how this survives Languish in Origins Limited or control shells in Constructed. As for its price, it’s going to see a fair amount of play in a lot of formats. I would expect this to start high and trickle down slowly over time. By itself, this card isn’t terribly impressive. Two mana for each +1/+1 counter is rather meh, even if there’s good value to be had when it dies. A little help makes it amazing, though. Doubling Season is the granddaddy of them all. 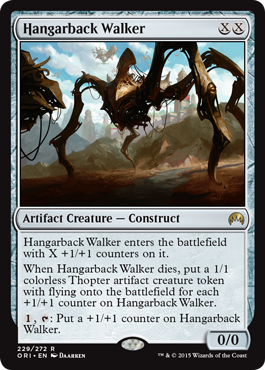 Season on five means Hangarback Walker for six mana and six counters, then twelve tokens. Ding! Parallel Lives, Gilder Bairn, even Hardened Scales will help this be better than its bulk price. I am not overwhelmed with this card. Everything depends on what you find, though it wouldn’t be too hard to build a deck where everything entered the battlefield, or left it, for value. I’d love to see this chained a few times and then reloaded with Second Sunrise or the like. Bulk rare. I don’t like to use the term ‘staple’ for EDH or Cube, as there’s a lot of ways to build your experience. However, almost everyone builds a ‘stop hurting yourself’ sort of deck that uses your opponents’ overpowered cards against them. Bribery is the oldest and most feared (target the Kaalia of the Vast player, get Iona, Shield of Emeria) and Knowledge Exploitation costs seven mana. Talent is more random in its payoff but it costs significantly less and might even get you two copies. Now if you’re play in this alongside Hive Mind in a Riku of Two Reflections deck…I’m going to to go make a sandwich while you figure out who does what first. This will not be a bulk rare, more like $1-$2, and likely $6 in foil. This is amazing. Just amazing. Normally you have to do a lot of work to copy spells, like get Riku of Two Reflections to survive. The Goggles pay you off easily and almost immediately. Suddenly, Lightning Bolt is a great card to hold till turn five, when you can double up on it. This is another card that doesn’t require mono-red spells, either. Invoke the Firemind is my first thought, but there’s all sorts of great spells to copy. 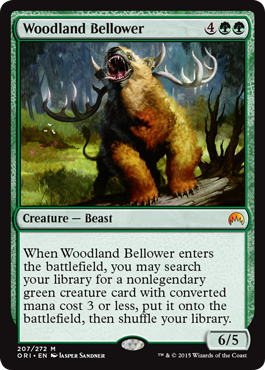 I wouldn’t be surprised if this popped up as a fun-of in Legacy or Modern. 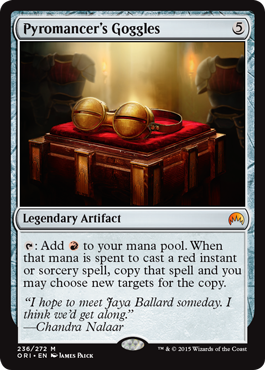 It’s true that more people maindecking Kolaghan’s Command makes the Goggles a weaker inclusion, but how much value do you get if you’re copying your own Command? This is going to be $3-$5 in regular and more than $20-$25 in foil all summer long. The prices will creep down, but if an Eternal deck does well with it, it’ll spike pretty hard. People are brewing in lots of formats with this humdinger of a Donate target, and it’s tricky to evaluate. In cube, it’s unlikely to see play, but there are all sorts of Jinxed Idol/Bazaar Trader/Zedruu the Greathearted decks out there. 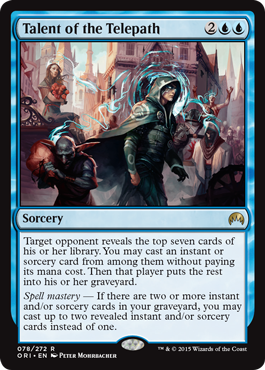 I see this as another $5 card with a big premium on the foil, $15-$20. Yet another case of a BLUE Mage over-valuing crap blue cards and undervaluing GREEN cards. Evolutionary Leap is not a bulk rare. I think the two Blue cards you mentioned definitely are though. Didn’t you hear? Green is the new Blue.